I felt I had to report that last night, I slept the most since Holly has been born! She ate at 5:40 p.m., at 11:50 p.m., and then again at 5:45 a.m. Way to go, Holly! She even went back to sleep again until 9:15 this morning, letting me get a couple more hours of precious sleep. Now, I know this was a total fluke and will probably never happen again, but it was certainly amazing to get a few good chunks of sleep last night. Now, for some more Holly pictures. Andrew is teaching Holly to walk already. She is going to be very advanced for her age. I just think this picture is adorable. She was sitting on Andrew's lap and making the cutest face. 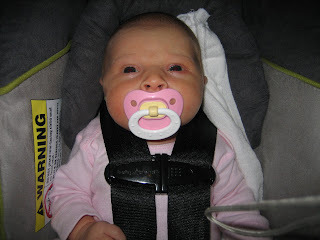 This is Holly in one of her happiest states: in her carseat, with her paci. She actually slept in her carseat at the foot of our bed the first week she was home (she will probably need therapy for that, too). 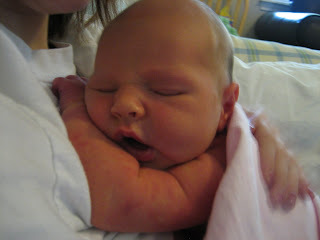 However, it was the only way we could get her to sleep because she hated being flat on her back. She has now given up the fight to her new sleep positioner. Okay, we think this is hilarious...but maybe we're just mean parents. Holly is the source of so much entertainment for us! 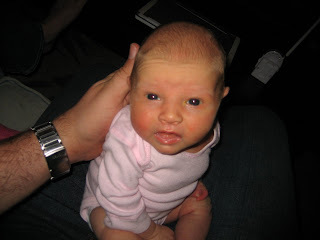 I cannot belive that our baby is three weeks old today! 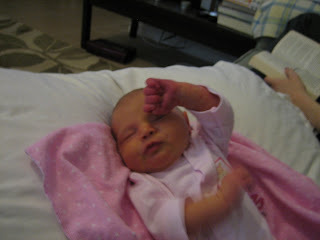 The past three weeks have passed in a blur of feedings, diaper changes, and not much sleep. Recovery from childbirth has been tougher than I expected. I actually don't know what I expected, but for some reason I thought it would be a walk in the park! I never anticipated feeling so tired and so...yucky and woozy all at the same time. 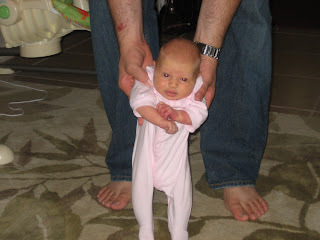 Now I can fully appreciate what new moms go through after having a baby! 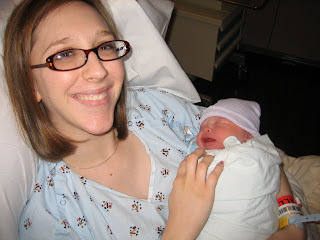 We ended up staying in the hospital an extra day, until Saturday the 6th, because the delivery was a little rough on me. 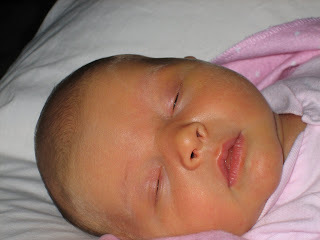 Thank goodness for that, because I could hardly get out of bed the day after Holly was born! Maybe I'm a wimp, but I just felt so awful. It was quite the adjustment to being home and taking care of myself and trying to feel better and taking care of this little one! Luckily I feel like we're getting it now. Andrew has been so good with Holly and is such a lifesaver! It makes me upset when she cries or is fussy, but Andrew stays cool and calm and can handle things much better than I can when she is cranky. He has also been able to get a whole month off of work, which is great! Hopefully by the time he goes back I will feel like I have things pretty much under control. I hate to talk about how hard parenthood is, but it is such a blessing as well! I never imagined that we could love a little person so much. She is so cute and we enjoy her so much! Holly is a happy baby most of the time, which is great and makes her that much more enjoyable. 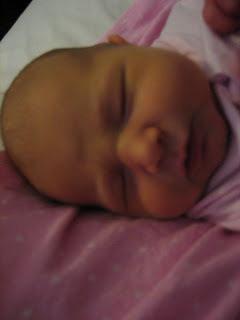 Here are some pictures that we've taken of her since being home. Quick note: I uploaded these pictures myself! I know how to do it now! 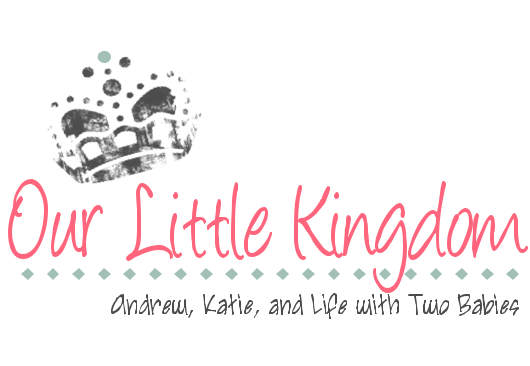 You will be seeing a lot more pictures on our blog since I finally figured it out. Yay! Our little munchkin is finally here! We went to the hospital to have me induced on Wednesday night (the 3rd), and we were both jittery (especially me) so we got no sleep! They started the pitocin on Thursday morning at 5 a.m. and things weren't too bad before my doctor broke my water at 7:30, as illustrated below. 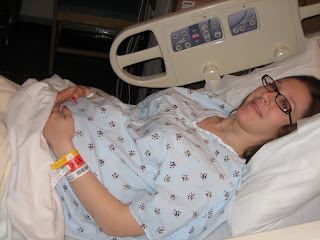 Then things started to get ugly and I got an epidural quickly! Things went so fast after they broke my water. 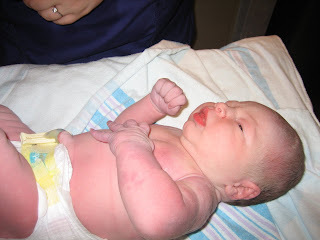 At 1:30 p.m. my nurse told me that it was time to start pushing, and I couldn't believe that our baby was almost here. I got really excited and had a surge of energy, thank goodness. 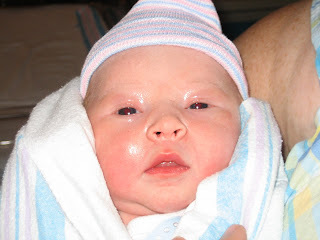 Little Holly was born at 2:35 p.m. and thank goodness, because I was exhausted by then. 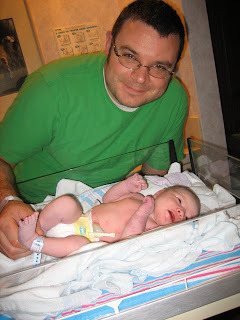 Here are some pictures of her after her bath on the warmer, with Andrew, and then with me when I finally got to hold her. It seemed like forever until they handed her to me! She was pretty puffy and had an impressive cone head when she was born, but after a few hours her swelling had gone down significantly. We are so excited to have her here! It's amazing how much love you feel for a little baby who just came into the world. We are looking forward to spending lots of time with our new little one.